Yesterday, and as the Secretary General of the Arab League was meeting with Syria’s chief tormentor, regime thugs visited the Matar family in Damascus Suburb with the body of their twenty six (26) year old son Ghiath. Along with the body, it was reported; the thugs handed the family their son’s larynx telling them, amidst their cries to make shawarma out of it. I am a grown man, and I don’t believe that men should not cry, for I do cry, sometimes even in sad or romantic movie. But since yesterday, my tears are bitter. And as I write these words, heavy rain falls where I live, and while I wonder if nature is crying for the brave youths of Syria, my tears race with the drops of rain and Ghiath’s beautiful smile seemingly wanting to re-assure me, I hear a voice I never heard before … “common old man, don’t cry….. I am but one of thousands and you will be free”. 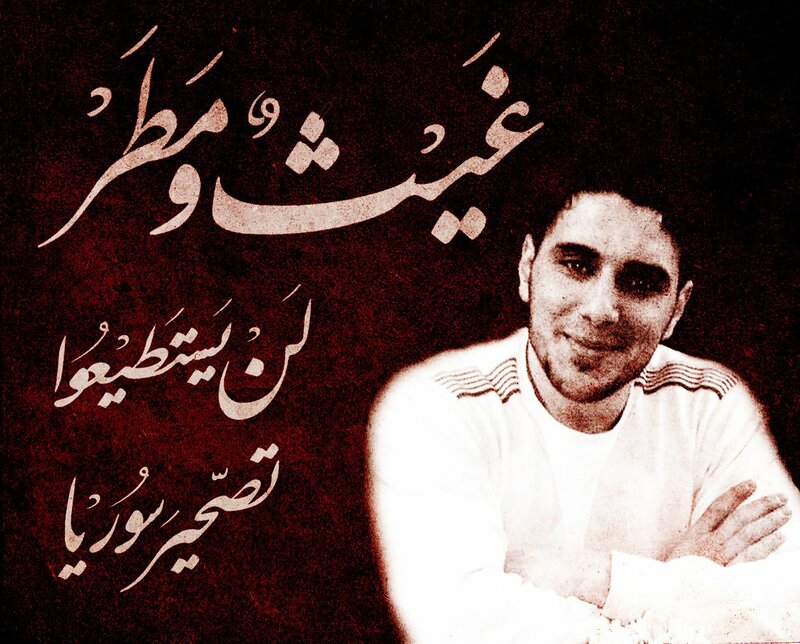 Ghiath was a leader in the Syrian youth peaceful movement. He was among those who demonstrated unparalleled creativity in non-violent resistance as he and his friends tried to greet those charged with suppressing them with flowers and bottles of water in the heat of Syrian summer. He was waiting for his first daughter when the hyenas kidnapped him after luring him with a trap turning his generosity and chivalry against him as he answered an apparent SOS call from a friend. Within three days of his arrest, this strong young man was dead because of torture inflicted by the Assad mafia hyenas. Have words been invented to describe the level of atrocious hate this regime has for its own people? Is their mutilation of the young bodies a manifestation of the rot that eats them? Is it fear that moves them? Is hatred? is it revenge? Or is it simply a death wish in need of an answer? Some may want to believe that martyrs will be happy in heaven, I think more of the living, the mother awaiting her son, the young wife longing for the strong arms of her handsome husband, the daughter who they want to have grow knowing the name and face for the man responsible for her not enjoying the cuddling of her father, his guiding words, and not holding his finger with her entire hand as she walks next to him in the market place. Curse the murderers, curse them for eternity. I leave you with what is being passed as to Ghiath’s last will and testament to his friends, while I was translating his words, my warm tears of cold rage raced along with my heart, my arms became week and my fingers felt inept to write appropriate words. I am now dreaming that my words would turn into winds that blows the face of Syria and that cleans, once and for all, the rubbish called the Assad regime, and all those whose moral compass is pointing into a direction of inhumanity, savagery, and hate. If words of my martyrdom pain you, be comforted in the knowledge that I have now simultaneously attained both happiness and freedom. I wish if I can come back to life so that I can once more carry the banner of justice, dignity, and freedom and to be martyred once again…. Don’t think they have finished me off with the bullet they fired. And my will to you to remain true to the principle we went out for, and to work toward achieving all the slogans we raised until they become a living reality, to persevere in your courage no matter how they tried to get you of to throw your ranks into disarray, don’t allow them to change you, don’t cheapen my blood, and the blood of the martyrs who gave their souls for a free Syria, don’t sell our sacrifices for any price. Don’t dialog with your executioners but wrest your rights from them with your determination to achieve victory. Every time we went out, when our chants shook the earth, and instill terror in the hearts of cowards, I sow freedom approaching and victory being achieved … From my world, I now see it approaching nearer to you. Do persevere for victory is but one extra hour of perseverance. Do not despair even if the whole world fought you and denied you. Do not stop even if the repelled you and erected barriers and obstacles in your ranks, do not you turn back or they will get you, destroy you, and with you destroy the dream. Do not surrender for by that you sell our precious blood, and all of the efforts we made for a free dignified homeland. Remember me when the shouts tower, when the women ululate at the wedding ceremony of martyrdom, and whenever a demand of ours is achieved along the way to freedom. Remember me when you celebrate the fall of the regime and the liberation of our homeland from the abusers. Remember me every time you plant a Jasmine sapling in Syrian soil, every time you lay a brick in a building, and when you see the future in the eyes of children, and remember that I gave my soul and my blood for that moment. OTW : Yassin Al-Haj Saleh just published this article in Al-Hayat about militarism, violence, and the revolution . Given that it falls right in our discussion, I have spent sometime to translate it to English using machine translation as a start and then performing very heavy editing. I think it is a good article coming from an intellectual who is not only on the inside, but also on the run. Little can be gained from discussing the growing military dimension of the Syrian revolution without placing it in the context of the 320 days of unconstrained and rampant violence practiced by the regime in its attempt to quell the revolt from the outset. Not much can be gained either by discussing intellectual, political, and psychological shifts that have occurred and are occurring in the society and within the revolution’s own environment throughout these bloody months. The outlines are known. The regime threw the army in to confront the foci of the Revolution and It killed many in the field who who refused to fire on their fellow citizens (Human Rights Watch report in December), leading some officers and soldiers to defect and out of these defections a loose umbrella was formed under the name «the Free Syrian Army FSA». The regime directed punitive and vengeful disciplinary campaigns akin to colonialist campaigns at cities and towns in and around Damascus, Homs, Hama, Idlib, and Deir Al-Zour , which resulted in civilians picking up arms here and there to face regime’s forces, albeit the regime has already pushed civilians in the conflict since the beginning and on a large scale: the Shabbeeha. These circumstances, which are known to all, imply an authentic military component of the revolution that can’t be overlooked in the context of its intellectual or political planning considerations. This dimension is neither brought from the outside nor does it possess an ideological underpinning that may have preceded its emergence. The emergence of this armed component does not undercut, today or since its beginning, the overarching peaceful character of the revolution. The peaceful nature of the revolution is rooted in its social composition, in the type of its demands, and in its primary protest tools (i.e., demonstrations), and not in any ideological preference or political tactics. It is now known that the juxtaposition of peaceful demonstrations flying banners and shouting chants and armed groups firing bullets does not say anything about what is happening in reality, but only covers the ignorance of those making such argument of the reality of what is happening with only figurative approximations. In fact, it would not have been possible for the peaceful demonstrations to continue in most of their sites had it not been for the protection provided by the Free Syrian Army with both of its military and civilian component and had it not been for its relative deterrence of the striking arms of the regime. Refusal to see this reality does not change it and hinders its understanding and more so the ability to influence it. And perseverance in reiterating argument against the arming of the revolution and against militarization without the slightest indication of a cessation of violence from the regime is akin to blaming the victims for their resistance to the aggressors. There are no nationalistic or humanitarian justifications for such an attitude. There is no doubt that at abstract values level, peaceful resistance is preferable to armed resistance. However, we are not in a store shopping for this or that, but in macro-scale reality, which imposed on a substantial number of Syrians the need to defend themselves as they faced a regime whose precise composition is what breeds hatred and violence and not emergent exigencies, nor popular demands, as a massive Syrian minister had recently uttered. What requires understanding and caution is that resorting to militarism can be associated, and today is actually becoming associated with anarchist and undisciplined practices. We can not deal with this reality with puritanical logic that refuses any armed resistance, or objects to the revolution itself under the pretext of the anarchist practices that may occur under its banners. This will not work as long as the regime persists in its own militarization. What could be useful is to work at the level of the revolution, not from outside or above, towards the direction of uniting the militant and civilians in a single concerted body and that the military component of the revolution be disciplined and directed by its general interest. This is not easy, and there is nothing that guarantees its accomplishment at the required level, but to continue singing about peaceful actions is a recipe that ensures it does not happen at all. Notwithstanding the prospects for chaos, violence is formatively elitist and un-democratic, and expansively spread of its exercise, even if it is disciplined, may raise the threshold of identification with the revolution and weaken the participation of women and children and the elderly. Our choices, however, are not between militarization and the non-militarization, but between unchecked and undisciplined militarism, and that of a checked, and perhaps more disciplined militarization. Furthermore, political change achieved by armed force may result in many social, political and security complexities, which is less favorable to democratic development than a peaceful transformation. But, again, our choices are not free, and the military component of the revolution is a byproduct of the intrinsic violence of the regime, not because of someone’s will or decision. The key point in all this debate is that there remains no room to restore the original innocence that predated blood, or to leisurely talk about facing the regime’s violence with bare chests, especially when expressed by those who do not participate in the revolution, neither with their chests nor with their backs. What is needed instead of illusionary innocence are initiatives and work toward military, political, and moral discipline of force. We have a chaotic unchecked reality, and the intellectuals and politicians perform their duty when they work to make it rational and organized and not when they purify and distance themselves from it. This is weakness. In fact, some of what is being said regarding militarism is driven by objection to the revolution itself and not by objection to the legitimacy of some of the practices under its banner. Revolution means the removal of the legitimacy of the regime and the denial of its national and public character, and, consequently, considering its violence a factional and unpatriotic, and the denial of any legitimacy and generality of any of its organs, which establishes the foundations for the new legitimate and popular, which is he revolution itself. While this does not confer an automatic legitimacy on all violence that may be exercised in its name or shadow, the only position that provides consistent objection to the uncontrolled violence is a position from within the revolution and with it, and not outside it or against it. Certainly, revolutionary violence is more legitimate than the violence of a regime murdering the people. It is a multiplier of legitimacy in that it is essentially forced and defensive even when it is offensive at the tactical level. There is already a genuinely peaceful mood in the revolution that dislikes violence, even in self-defense. But the best defense of peaceful action is to participate in the revolution including on the ground, and to work hard to strengthen its civil nature. The worst defense is to sit on the sidelines and singing praise of the beauty of peaceful actions. From the viewpoint of action, there is a need for legitimate public entity, that transcend the external embrace of the revolution’s cause and the standing beside it towards engagement in the revolution and the intellectual, political, and organizational morphing in manners responsive to its evolution and growing complexity. Such a public body would have coordinated between the components of the revolution and led it to achieving its national objective. Alas, this is not available. But one of the causes of optimism in Syrian Revolution is the multiplicity of the centers of thought and initiative, which proceed without the guidance of anyone, and never stop working in order to discipline the militarization and to develop the civil and popular character of the revolution.